Looking for patterns, trends and discrepancies—there is mounting evidence that the environment can trigger heritable changes in epigenetic factors. This is highly topical given some recent events in the science news. But firstly, for a primer on epigenetics, check out Sci Show for their episode on Epigenetics. Epigenetics is essentially “…genetic control by factors other than an individual’s DNA sequence.” (Simmons). These factors are thus important in the switching on or off of particular genes. While this happens throughout life, particularly during embryonic development, it is the growing body of evidence of environmental influence during adulthood that is particularly exciting. A recent study investigating the genomes of obese men and obese men before and after bariatric surgery detected epigenetic effects coded in men’s sperm (Donkin et al.). The environmental factors of obesity, as well as recovery from obesity, seem to effect the genes coded in the sperm, thus influencing the genome of future offspring. These genes seem to be linked to appetite control, providing intriguing insights into how obesity may become genetic and not just environmental. If the environment affects genes and these changes are passed on to offspring, rather than the genes you were born with and inherited from your parents, then there are some very interesting possibilities that emerge for evolution. As one scientist commented, this is a “…provocative start to asking some really interesting questions,” (Simmons). Consider some of these yourself – it makes you rethink topic 5! Donkin, Ida et al. ‘Obesity And Bariatric Surgery Drive Epigenetic Variation Of Spermatozoa In Humans’. Cell Metabolism (2015): -. Web. 10 Dec. 2015. Zusi, K. ‘Obesity Alters Sperm Epigenome | The Scientist Magazine®’. The Scientist. N. p., 2015. Web. 9 Dec. 2015. Developments in scientific research follow improvements in computing—the use of computers has enabled scientists to make advances in bioinformatics applications such as locating genes within genomes and identifying conserved sequences. Bioinformatics is the application of computer science to molecular biology, allowing the creation of massive databases of molecular information (proteins, genes, DNA sequences etc.) You might remember from our Crash Course video on replication that one cell contains genetic information equivalent to a stack of single A4 pages nearly 100m high! It is only the advent of powerful (and affordable) computers over the last 25 years that has enabled the collection and synthesis of genetic information on a large scale. To explore this topic, we will be performing a BLAST search using resources from the European Molecular Biology Lab (EMBL). We will be searching for information about the Protein PAX6 through a series of databases on the web. The activity we are doing can be found through the EMBL’s education section, the European Learning Laboratory for Life Sciences. 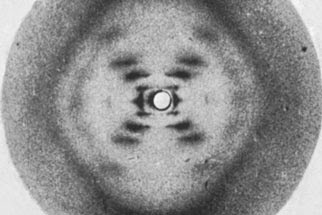 Photo 51 is Rosalind Franklin’s famous image of the DNA double helix. When he saw this image, James Watson is reported to have said, ” The instant I saw the picture my jaw fell open and my pulse began to race.” To the trained eye, this cryptic, black-and-white image immediately reveals the helical structure of DNA, as well as the relative positions of the sugar-phosphate backbone and the nitrogen bases. It was the scientific evidence needed to understand the structure of DNA. Watson and Crick, although they knew that this meant a helix, were not fluent in the chemical knowledge that would allow them to calculate ratios and distances. This information was provided by Maurice Wilkins, their co-recipient of the Nobel Prize and Rosalind Franklin’s co-worker. Additionally, it was Franklin’s work as part of a chemical report in 1952 that finally convinced them to put the bases on the inside, rather than the outside. While Wilkins shared in the Nobel Prize, Rosalind Franklin did not. Her research was not published until after Crick and Watson’s article and so she was not cited in their list of references (though she was thanked in the acknowledgements section). Speculation remains that she was taken advantage of to one degree or another and did not receive the accolades she deserved. The controversy was only heightened as she died at age 37 in 1958 and so was ineligible for the Nobel Prize. “Secret of Photo 51.” PBS. PBS, 2003. Web. 17 Oct. 2014. <http://www.pbs.org/wgbh/nova/photo51/&gt;. All original research papers from 1953 on the discovery of the structure can be downloaded as PDFs from the journal Nature.